Preen Gland Tumors - The preen / oil gland is enlarged and distorted in shape. As a result the small feathers over the gland become raised and the tail feathers tend to fall out and not regrow. Baldness is an acquired loss of feathers on the head. It is commonly seen in canaries and cockatiels. A hormonal imbalance and genetics are believed to be responsible. Baldness can also be caused by over-preening by a mate. Inactive, undersized and/or diseased follicles are common causes of baldness. Patchy feather-loss on a bird can be a sign of Vitamin A deficiency, which can be treated by supplementing your bird's diet accordingly. Patchy feather loss can also be caused by ringworms. An abnormal molt occurs on some birds, causing them to lose all of their head feathers at once. The birds may be juveniles undergoing their first prebasic molt. It's also possible that feather mites or feather lice may cause baldness. For example, in cockatiels the white feathers may take on a more yellowish color (doesn't happen in white-faced cockatiels though). African Greys may develop red feathers in areas that are usually gray and feathers in eclectuses may turn yellow, orange and potentially red. Scattered feathers of an unexpected color can be an indication of damaged feather follicles (usually because of feather plucking). Over-supplementation with Vitamin "A" may also cause these feather changes. Medication - for example administration of antibiotics at the time a bird is molting has caused temporary changes in feather coloration; these feathers are usually replaced with normal coloration feathers at the next molt. There is a good possibility of sickness, malnutrition (please refer to bird nutrition), liver disease or kidney problems. Although it is possibly that genetics is involved and that it is a mutation. It is easy enough to differentiate that -- depending on whether a parrot developed these red feathers over time (which would be an indication of health problems), or whether they were born with it, which would point towards genetics / mutation. Commonly seen in budgies and may be likened to catarrh of a mucous surface and occurs in many types of chronic ill health. Apparently it is not caused by local infection, and ideally treatment consists of finding and treating the underlying cause. The cere (the structure containing the nostrils) hypertrophies, becoming cornified and keratinized. It may develop a prominent "hornlike" appearance. This condition is most common in female birds and is believed to be associated with breeding in females and estrogen secreting gonadal tumors in males. Treatment: Conventional vets recommend to moisten and gently remove the heaped-up material (especially if it flakes and blocks the nares), and applying a little oily lotion, cod liver oil, Dettol or bland ointment. Polyfollicles is the growth of multiple feather shafts from one follicle. It may cause no problems or may be associated with chronic inflamation in feathers and skin. An itchy pollifelliculitis has been seen in lovebirds and budgies. The tail and dorsal neck area are the most common areas affected. This condition is thought to be caused by a virus. Chlamydophila psittaci - Primary symptoms in birds would be an upper respiratory infection with nasal and/ or ocular (eye) discharge, poor feather condition, diarrhea with the possibility of conjunctivitis and other symptoms. This is a disease that is transferable to humans. So if flu-like symptoms in the family exist and don't seem to resolve themselves, the vet should urgently be consulted. Deficiencies of minerals, such as calcium, zinc, selenium, manganese and magnesium, may be associated with brittle, frayed feathers and itchy skin. There may be alterations in color or discoloration of feathers. The plumage can appear dull. Feather loss and moulting disorders can occur. *Dietary: Poor feather condition / long molts and flaky beaks may be the result of a diet deficient in the essential amino acid "methionine." The requirement for methionine tends to increase when accumulated levels of toxic substances in the body increase. High levels of methionine can be found in sesame seeds, pumpkin seeds, sunflower seeds, Brazil nuts, fish, meats, eggs, as well as various lentils. Significant amounts can also be found in spinach, potatoes and boiled corn. Supplementation is another option for birds that don't have access or refuse to eat foods rich in methionine - such as spirulina, which is rich in this amino acid. Once nutritional needs are met, it may take 9 to 12 months for new, better feathering and the flaky beak to be replaced with a new, smooth one. A single bird was seen with a patch of feather loss on one side of its body associated with a thick, grey, flaky skin. This proved to be a case of ringworm due to infection with a Trichopyhton fungus. The disease should have been curable but the owner did not want the treatment carried out. Ulcerative dermatitis refers to red, oozing, ulcerated skin. The affected area is often swollen and the bird often has an elevated white blood cell count, indicative of infection. Ulcerative dermatitis can be associated with previous trauma, wounds, diabetes and certain intestinal parasites. The bird picks at its skin, creating the ulcers. These sores are frequently itchy, causing the bird to pick at the area more. Bacterial and/or fungal infections may occur secondary to the lesions. Treatment consists of trying to determine the underlying cause, cleaning the wound, using an appropriate topical and systemic antibiotic, and placing a collar to allow the wound to heal. 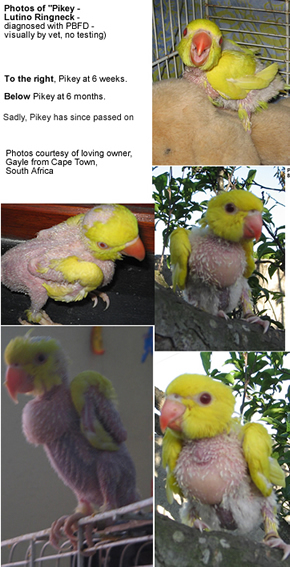 Lovebirds, cockatiels, grey cheeks, amazons and cockatoos are most often affected.